This entry-level model is well-equipped with a 2.0-liter turbocharged four-cylinder good for 248 horsepower, practical tech and connectivity options, ergonomic seating, and power everything. Available in RWD or AWD with xDrive system. Available only in a Gran Turismo configuration, the new BMW 535i offers many similar features to the 530i, but is instead equipped with a standard 300-horsepower 3.0-liter Turbo six-cylinder engine. Available in RWD or AWD with xDrive system. 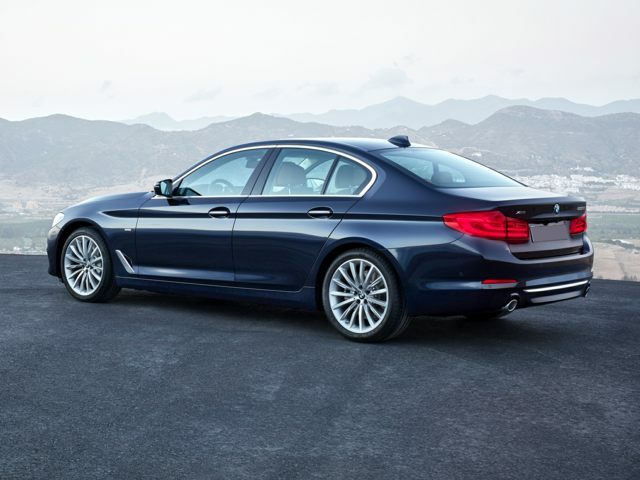 This powertrain is one of the best hybrid-electric options on the market for a midsize luxury car, giving you the spirited performance of BMW's turbocharged inline-four paired to a sharp electric motor, combined with the legendary comforts of the 5 Series. Available in RWD or AWD with xDrive system. The mid-level BMW 540i offers an exceptional balance of value, practicality, and performance, and packs BMW's 3.0-liter inline-six turbo engine under the hood. It's one of the most powerful 5 Series sedans, and can sprint to 60 in just 4.7 seconds. Available in RWD or AWD with xDrive system. Want the very cream of the crop? The 550i xDrive boasts a standard 4.4-liter BMW turbo V-8 engine rated at 445 horsepower. It's the most-powerful 5 Series model, available only as a Gran Turismo (the way this engine was meant to be enjoyed--on long trips along open roads) and is flavored with the best of BMW features. Standard with xDrive AWD system. The new BMW 5 Series is available in two body styles for 2018--a sleek four-door sedan and a roomy five-door Gran Turismo; the former is more fuel-efficient and feels a bit lighter to drive, while the latter features a coupe-like design and impressive engineering, and offers slightly more cargo room. Raleigh-area drivers who must be able to pivot quickly to meet demands may prefer the flexible interior of the Gran Turismo model. Regardless of body style, every new BMW 5 Series is built to meet the high standards of one of the world's best luxury brands. See why the midsize 5 Series line of cars has found its place in history. Want to know more? Explore new BMW 5 Series inventory at BMW of Southpoint, or visit our Durham luxury car dealership to browse models or to take a test drive.